If you or someone close to you has been diagnosed with cancer, you know how overwhelming it can feel. Foundation Medicine is here to help. We are a company made up of scientists, doctors, and other highly trained and experienced professionals committed to providing genomic insights to help your doctor guide your care. If you are ready to get started, use the section links below to learn more about our tests and avenues for financial support, or to access our additional resources. You can also find answers to commonly asked questions. If you'd like to reach out for more information, please contact us. Our bodies are made up of trillions of cells. Each cell has an instruction manual called DNA, which tells the cell how to grow. Sometimes, the DNA in our cells gets damaged or mutated, causing cells to grow out of control. Cancer is a disease caused by this out-of-control growth. Usually, our natural immune system can stop abnormal cell growth before problems happen. But when it doesn't, cells keep growing to form tumors. PLEASE VIEW OUR "CANCER EXPLAINED" VIDEO TO LEARN MORE ABOUT THE SCIENCE BEHIND CELLS, DNA, AND GENES IN CANCER. Cancer is often treated with chemotherapy, which tries to kill any fast-growing cells — sometimes killing healthy cells in the process. Drugs called targeted therapies and immunotherapies can more carefully select the cells they kill, making it easier to stop only the cells with mutations, and leaving healthy cells to grow normally. A targeted therapy may stop the growth of cancer cells by targeting specific mutations in a tumor. An immunotherapy helps your body's own natural immune system find cancer cells and kill them. Clinical trials are performed for targeted therapies and immunotherapies that are currently in development. By participating in a clinical trial, you can access the latest advances in patient care. "FOUNDATION MEDICINE APPROACH" VIDEO FOR PROFESSIONALS. What is Comprehensive Genomic Profiling (CGP)? Comprehensive genomic profiling — also known as biomarker testing or tumor profiling — is a method of cancer testing that can find the mutations in your cancer’s DNA that may be causing your cancer to grow. Foundation Medicine’s comprehensive genomic profiling tests look at hundreds of genes that are linked to cancer. For solid tumors, we can look at cancer genes directly in tumor tissue and also in your blood, and for blood cancers we can look at cancer genes in your blood and bone marrow. The mutations in your cancer’s DNA may help your doctor identify a targeted therapy, immunotherapy, or clinical trial that is right for you. 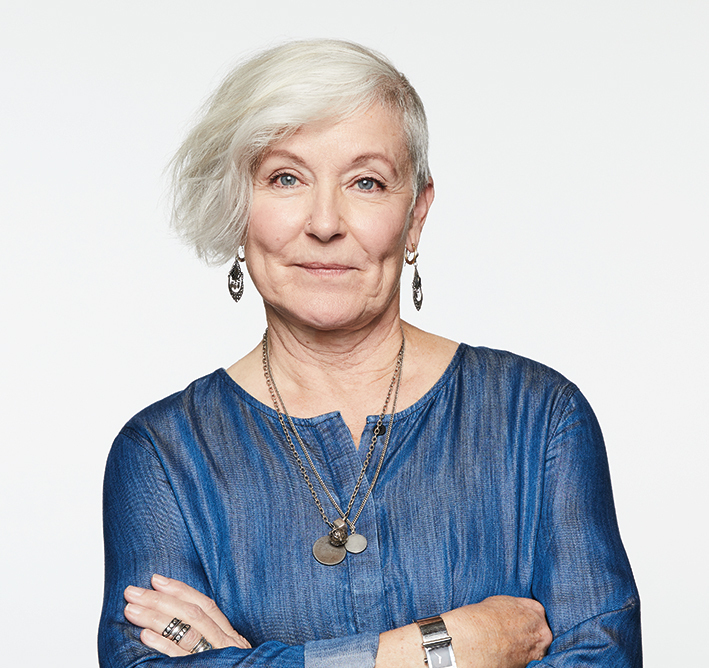 This approach to treatment is sometimes called precision medicine or personalized medicine because it is based on your unique genomic profile and cancer type. 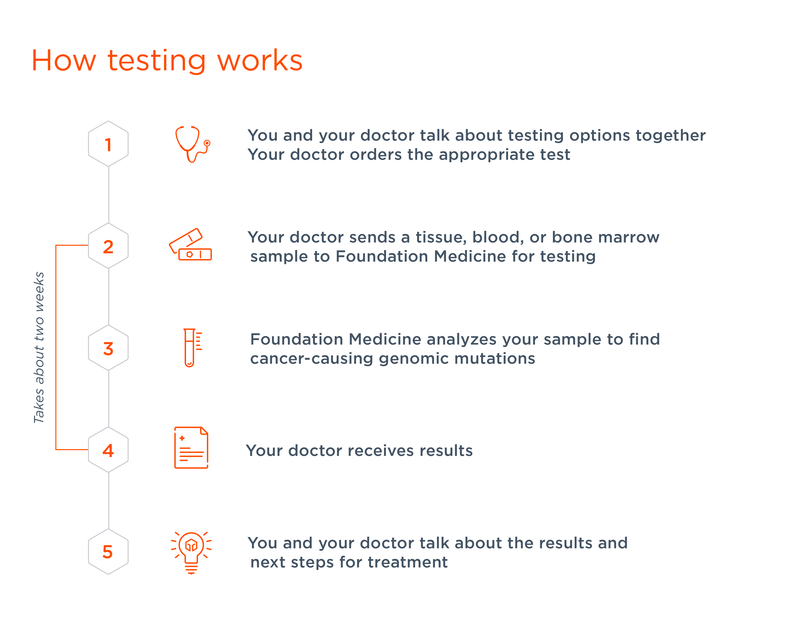 Foundation Medicine offers three different comprehensive genomic profiling tests. Your doctor chooses the test that’s right for you, based on your type of cancer, and the type of sample that will be tested. When testing is complete, a report will be sent to your doctor. You can also request a copy of your report by contacting us. After we test your tumor tissue, blood, or bone marrow sample for gene mutations, we will list any mutations found in the report. We also provide information about additional biomarkers that may be associated with immunotherapy response. Alongside gene mutations and additional biomarkers, we list any targeted therapies or immunotherapies that your doctor may want to consider as a next step in your treatment. We also list clinical trials that your doctor may want to consider. Ask your doctor about your Foundation Medicine testing options so they can help guide treatment decisions for you. Our billing and reimbursement services are designed to make comprehensive genomic profiling accessible to patients regardless of their financial situation. Depending on the specific test, you may already have coverage through Medicare or private insurance. If you are uninsured or concerned about the out-of-pocket cost of testing, please fill out a financial assistance application or contact our Care Team. Payment plans may also be available based on your financial situation. For many patients with advanced solid tumor cancer, FoundationOne CDx is covered by Medicare. Your testing is ordered by a treating physician. Note: If you are a Medicare/Medicare Advantage customer, you may need to sign an Advance Beneficiary Notice (ABN) prior to the test order. Your physician will determine if an ABN is required. 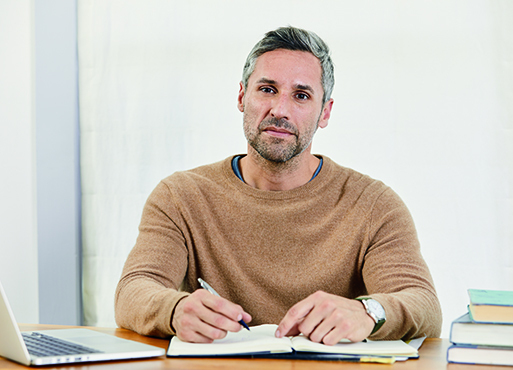 Depending on the terms of your insurance plan, you may have financial responsibility for co-pay, co-insurance, or deductible as directed by your plan. If your insurance company denies coverage, with your consent, we will work on your behalf to attempt to obtain coverage and will work with you and your doctor in pursuing appeals to minimize the financial burden. If you are eligible for financial assistance, this is applied to your out-of-pocket cost. Note: If you have private/commercial insurance, a prior authorization form may be required in some cases. 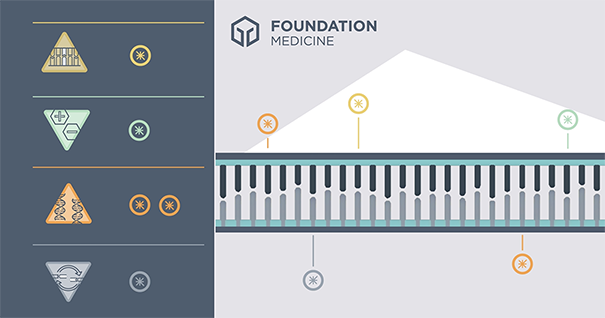 Learn more about Foundation Medicine testing and how it might apply to you. Learn more about financial assistance for Foundation Medicine testing. Apply for assistance in paying your out-of-pocket costs. Authorize a third-party to receive a copy of your report. Authorize your doctor to send us your sample for testing. Hear stories from patients like you about their experiences with Foundation Medicine. FDA-approved therapies: We identify approved targeted therapies or immunotherapies that may help you based on the mutations and biomarkers found in your cancer. These therapies may have been approved for your cancer type or they may have been approved in other cancer types. Rule out therapies: We look at hundreds of important genes to help your doctor know which medicines may not work for you. Clinical trials: We match your results with medicines that are currently in development through clinical trials. Talk to your doctor about which clinical trials may be available and if you might qualify. Genomic testing looks at mutations in the tumor itself. Genetic testing looks at inherited mutations that are in all cells. 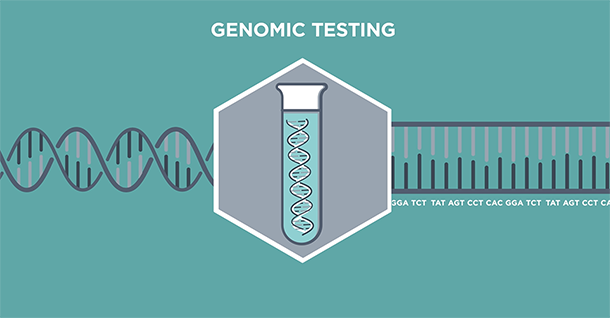 Foundation Medicine testing is genomic testing, which looks at the mutations in the tumor. These may have been inherited, or they may have been acquired over the course of a patient’s lifetime. We identify both kinds of mutations, but do not distinguish between the two. The mutations in the tumor are what may impact tumor growth, spread, and response to therapy. FoundationOne CDx and FoundationOne Liquid for solid tumor cancers are generally only used in more advanced stages. FoundationOne Heme for hematologic and soft tissue cancers can also be used at diagnosis, monitoring progression, and to guide overall clinical management. Talk to your doctor to see if our tests may be right for you. FoundationOne CDx is a next-generation sequencing based in vitro diagnostic device for detection of substitutions, insertion and deletion alterations, and copy number alterations in 324 genes and select gene rearrangements, as well as genomic signatures including microsatellite instability (MSI) and tumor mutational burden (TMB) using DNA isolated from formalin-fixed, paraffin-embedded (FFPE) tumor tissue specimens. For the complete intended use statement, including companion diagnostic indications, please see FoundationOne CDx technical information at www.foundationmedicine.com/f1cdx.